I’ll ask for a measure of forgiveness up front as I’m likely about to commit cinematic blasphemy. Is it wrong for me to suggest that Vittorio de Sica’s 1971 Best Foreign Language Film Oscar winner would have been a more interesting film had it not been set in the days leading up to the Second World War? Of course I realize that the story wasn’t plucked out of thin air, but based on the novel by Giorgio Bassini and narratively entrenched. Yet here in the 21st century I find my emotional response to the troubles of a exorbitantly wealthy and emotionally detached young woman and her pampered circle of friends somewhat lessened by the more visceral holocaust-themed films of the past two decades. I’ll come back to this later. I like de Sica very much. Shoeshine (hooray, I have a copy! ), Umberto D. and The Bicycle Thiefare extraordinarily powerful films, and while I find Marriage, Italian Style grating, Two Women (by the way, can we get a better print?) is a personal favorite — the scene in which Sophia Loren’s character encounters a group of G.I.s along the road and asks them to help her daughter is unforgettable. I’m wishy-washy concerning The Conformist, a highly disconnected and mildly self-indulgent trance of a film that scores more points for the impact of a few key scenes than it does as a finished whole. 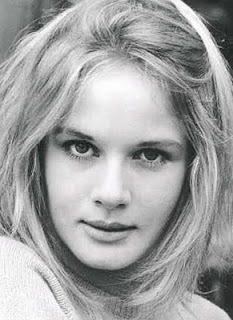 Both The Conformist and The Garden of the Finzi-Continis feature Domique Sanda in featured roles — though it’s a toss up as to which film does better by her. It would be easier to argue for The Garden, were it not for a single scene (the one in the woods, you with me?) at the end of The Conformist. Nevertheless, in Sanda we have an actress of astonishing beauty. The camera loves her so much that whenever she’s on-screen, in one of her abundant close-ups or no, you’re convinced she must have been the most beautiful woman in the world — and for what it’s worth I’m no fan of blondes. Sanda plays Micol Finzi-Contini (not Nicole — as she proudly corrects the Italian secret police when they come for her), the icy and ultra-sophisticated daughter of the titular clan. 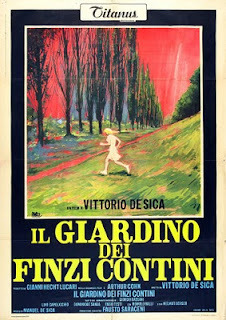 Tall, blonde, smoldering, and if not absolutely aryan then at least positively non-Jewish — as another of the film’s cast of characters remarks about all the Finzi-Continis. Micol has confined herself to the estate’s expansive garden and its tennis court, where she entertains numerous friends now that the fascist government has forbidden Jews from belonging to athletic clubs. The drama methodically escalates along two parallel tangents: at once following the soapy and angst-ridden romantic entanglements of the group of friends while, outside the protecting walls, their country inches ever closer to cataclysm. For her part, Micol is oblivious to the happenings outside her personal Eden, believing herself protected by her family’s money and five-hundred years at the top of the Ferrara caste system. 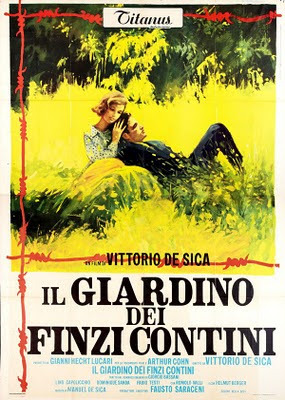 The Garden of the Finzi-Continis is not a neo-realist film like those that put de Sica on the international map in the years following the war. Professional actors fill all of the lead roles, and the production values are straight out of Tinsel Town. Quite frankly, this is one of the most beautiful films of its era, and it boasts a score by the director’s son that demonstrates that nepotism could, on occasion, be a very good thing. The influence of Hollywood filmmaking creeps in at the edges though, in the most cloying kind of way, as in pure summer-of-love style characters often move through an autumnal landscape to the accompaniment of wistful piano music — the only difference being that were this a Hollywood production there would be vocals. Jonathan Livingston Seagull, anyone? Kotch, maybe? My nagging problem with the story is its Titanic-like, yet unnecessary reliance upon real history to provide its characters’ lives with a sense of gravity that they wouldn’t otherwise have. It strikes me as manipulative and cheap, and like Titanic, a bit dirty. And here’s the kicker: If the religious / war subtext were removed, and the heft of the story placed on the Finzi-Continis and their inter- and extra-personal relationships, I might care be more engrossed, instead of constantly pushing aside the thought that while they cavorted inside the walls of the estate, real things were happening to far less fortunate people outside them. The film is often describes as one of the greatest of all time, yet I’d like to dig into the lives of this unique family without the guilt that comes with doing so — guilt that comes from caring about the petty problems of a family so undeserving and oblivious. de Sica would like for us to weep for Micol and the rest of the Finzi-Continis, but we can’t — our tears would be better spent upon those who didn’t blissfully turn their backs on the madness around them.